I-B CG GREETS PATTERSON Gen. Thomas Terry, India-Burma Theater commander, greets Secretary of War Robert Patterson at the Willingdom Airport in New Delhi. 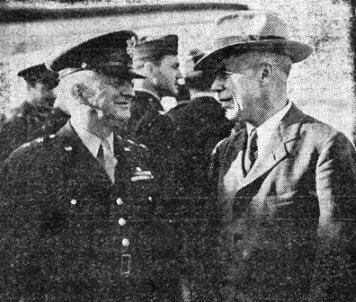 WAR SECRETARY PAYS BRIEF VISIT TO INDIA Roundup Staff Article "The Boss" blew into New Delhi this week, checked on demobilization and the disposal of surplus property, called on Lord Wavell, chatted informally with some G.I. 's during a surprise visit at the Red Cross Club and then took off in his C-54 for Karachi, Cairo, Frankfurt (Germany) and the States. Secretary of War Patterson said he left the States Dec. 30 for his first-hand visit of some of the major U.S. Army centers throughout the world and that he planned to return to Washington by air just as soon as he makes a last call in Germany. Patterson, after resting and attending a dinner given by General Terry, conferred with a group of Theater generals and their aides Saturday morning and, prior to his departure, held a press conference at Theater Headquarters. He told civilian and Army reporters that he had been given a review of the operations of this Theater since V-J Day, and was given an outline of what had been achieved and what remains to be done prior to the closing out of the Theater. He said the progress toward the date when all property can be disposed of and the Theater closed out is "most impressive to me," but that "a great deal" still remains to be done. He said the Theater had in excess of a million tons of material here on V-J Day. Patterson said the Theater has shipped out since V-J Day 100,000 men (including some from China) and added that this represented a "most commendable performance." About 31,000 troops will remain in the Theater at the end of January, he said. The War Secretary then added that the schedules call for the "rapid evacuation" of the remaining strength of the Theater. Asked when the Theater will be evacuated, he quoted Gen. Eisenhower's statement that 4,000 men will remain June 30, and he said that is the plan now in contemplation. "On the subject of property and equipment," he continued. "I will say that a great deal of hard work has been done - also that a great deal of hard work remains to be done. It is, of course, a formidable undertaking. Large amounts of property are involved and much of it is in areas that are remote." Patterson said "every effort" is being made to speed up the job of finishing the task in the Theater and that Gen. Connolly, the expert who handled a similar task in Iran where the Persian Gulf Command sent supplies to Russia, is here aiding in the work. The Secretary was asked if he could say at this time whether any troops from this Theater may eventually be required to go to China to fill vacancies there. he replied that he could not say off hand but that the great bulk of the men here will be on their way home by April 30 and June 30 under the recent War Department directive issued by Eisenhower to get high-point and long-service men out of the Army. It is the policy of the War Department, he said, to evacuate all Theaters just as soon as the work of the Army can be completed. Local Program Follows WD’s Demob Policy Roundup Staff Article Lack of replacements to step into many assignments necessary to the closing of the India-Burma Theater, and lost time involved in training newcomers has resulted in a new Theater policy, hinged on "declarations of surplus" in releasing personnel for return to the United States. Its context is that troops otherwise qualified for return to the States will be released for return home immediately after being declared surplus to the needs of the sections in which they serve. The new policy for the I-B Theater is in keeping with the War Department's demobilization program as announced Jan. 15 - main point of which calls for male enlisted personnel with an ASR score of 45 or above as of V-J Day or with at least 30 months' service to be home or on the way by April 30. These men will be released from I-B duty by April 15. 1. Male officers with an ASR score of 67 or above as of Sept. 2, 1945, or with 45 months service as of April 30, this year. 2. 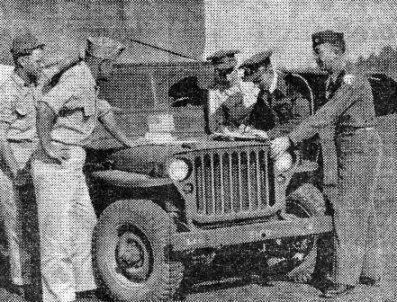 Male officers (including Medical Administration Corps officers) who have signed a Category Iv or V volunteer statement and have 45 points or more as of V-J Day and are declared surplus. 3. Enlisted WACs with 24 months service as of April 30. 4. WAC officers with 36 months service, also of April 30 next. Persons eligible to return to the United Sates from this Theater are being moved to the Calcutta port of embarkation in accordance with monthly quotas based on analyses of reports submitted by section and troop commanders. Regular and special Air Transport Command flights are being employed in movements, which began Monday. Personnel will be processed at Replacement Depot No. 3, Camp Kanchrapara. Highest points and longest service, particularly combat, will be considered first in shipments. Intermediate Section - 3,240 enlisted men and 413 officers; Army Air Force - 1,670 EM and 515 officers; Air Transport Command, India-China Division - 1,600 EM and 634 officers; 4th AACS Wing - 856 EM and 42 officers; Theater Special Troops - 645 EM and 113 officers; Base Section - 531 EM and 514 officers and 10th Weather Region - 34 EM and 15 officers. RATHER CHILLY, WHAT? Sultry brunette Beverly Michaels, popular showgirl from Billy Rose's "Diamond Horseshoe" in New York, gives us a hint to the cause for popularity, Peek-boo. or medics, with 65 points as of last Sept. 2 or 42 months' service as of June 30. Separate instruction covering the discharge of WAC personnel, officer and enlisted, for the period after April 30, 1946, will be issued later. Medical Corps officers will be demobilized by separate criteria to be established by the War Department. Eligibility for separation of personnel made eligible by previously published criteria is not affected by the War Department's new orders. Such personnel will be given priority. Zone of Interior and Theater commanders are responsible for the immediate release of every individual for whom there is no military need. However, no individual will be discharged under this directive with less service or smaller scores than set forth. HONG KONG - (UP) - A 25-year-old Chinese woman spy for the Japanese, Miss Huang Meili, was executed by a firing squad this week at Canton. The report said she walked calmly to the execution ground. 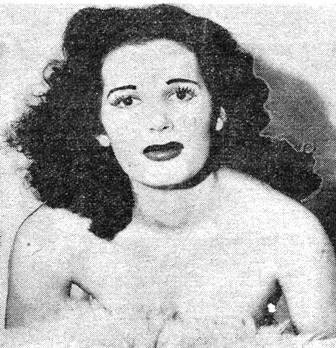 Miss Meili spent her childhood in Japan and married a Jap during the occupation. The dead are coming down from the Mogaung Valley - those American dead from the military cemetery at Myitkyina. They are being moved to a new resting place. They were the infantrymen, the air crewmen, the engineers, the quartermaster truck drivers and all the others who paid the most for victory at Myitkyina, Mong Yu and Bhamo. They died under trees, in weeds, in tents and basha dwellings, in bright sunlight and monsoon gray, at night and in flames. They died because a plane fell, a truck skidded, a Jap soldier aimed well, a typhus germ thrived. Now they are leaving the wilds . . . being flown south by the Air Transport Command to be interred in United States Army cemeteries near Calcutta, at Barrackpore and Kalaikunda. The project, under control of Chief Quartermaster, India-Burma Theater, calls for concentrating all American military dead in the two Calcutta area burial grounds. There the graves are easily accessible to visitors and are close to port facilities. One day the caskets may be moved again - for the last time - home. Myitkyina's is fifth on the list of outlying cemeteries in this Theater being evacuated. Four C-47's are doing the job. Approximately 900 removals have been completed from Tezpur, Jorhat, Chabua and Ledo. Some 1,500 known buried still are to be transferred. In Barrackpore and Kalaikunda, deceased from 18 United States-maintained temporary cemeteries in the Theater will lie. Others will come from 25 British military and nine civilian cemeteries. Some few more - unburied and unfound at this time - will be taken there later. American troops are still combing undergrowth, scaling hills, sloshing through marshland, pushing a quest to recover remains of other military personnel who perished months or years ago. Three hundred and forty-five plane crashes involving 1,162 persons have been reported to the I-B Graves Registration Section. The location of nearly 50 percent of these crashes is unknown, many having occurred in the high Himalayas or in Western China. Among foremost authorities on recovery of India's and Burma's lost American dead is ex-GI Donald H. Weeks, now lieutenant in charge of Graves Registration Section in New Delhi. A field veteran, he trekked hundreds of miles in the 678,000 square miles covered by I-B searchers. He and Lt. William M. DeLoach, now in the field, helped organize the 49th Graves Registration Co., this Theater's first and only. Another long-time field worker is T/Sgt. Coolidge A. Rollman, who volunteered to stay when other high-point jungle searchers went home. Presence of the enemy in some areas kept American searching parties from reaching scenes of airplane accidents until the jungle's quick vegetation had concealed all markings. But the search goes on. The searchers are certain the ones they seek would rather sleep in native soil. CHUNGKING - (UP) - Fighting between Nationalist and Communist troops still is continuing in seven zones along five railway lines in North China despite a week-old cease-fire order, dispatches from Peiping said this week. Nationalist Gen. Cheng Kai-Ming, one of three members of the executive cease-fire commission, was quoted as saying that conflict still rages at Tsining on the Peiping-Suiyang railway, at Kuphekow on the Peiping-Jehol railway, at Licheng and Tsaochwang on the Tientsin-Pukow railway, at Anywang and Yuantze on the Peiping-Hankow railway, and at Weihsien on the Tsinan-Tsingtao line. 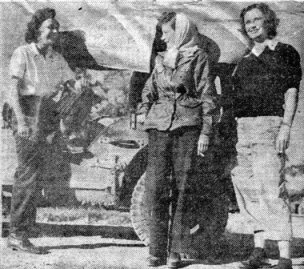 American observers aboard AAF planes were making an inspection tour of the disputed areas including Kupehkow, but it was emphasized that the cease-fire commissioners carry no authority to order a halt in the fighting. Meanwhile, demobilization of both armies was begun. The Nationalist government said that 3,000,000 men will be discharged within the next three months. The chief Communist delegate to the current peace assembly said that his forces would be reduced to 20 divisions - between 300,000 and 400,000 men - within the same period. Earlier in the week dispatches from the north disclosed that Nationalist troops had entered Mukden, making the symbolic restoration of Manchuria to China. SENATORS HOLD HEARINGS IN NEW DELHI Members of the Senatorial sub-committee which conducted hearings on the disposal of surplus property in the I-B at New Delhi and Calcutta last week are shown in the midst of a conference held in the War Room at Theater Headquarters. A sub-committee of the Senate's Mead committee, currently engaged in the investigation of American disposals of surplus property throughout the world, paid a flying visit to India last week and heard I-B Theater officials testify as to the progress of such work here. The sub-committee, consisting of Sen. James K. Tunnell (D-Del.) and Sen. William F. Knowland (R-Cal.) was accompanied by George Meador, general counsel for the Mead committee, as well as Army and Navy aides. Arriving in New Delhi late Wednesday afternoon, the group held conferences throughout Thursday and departed early Friday morning for Arabia from whence they will got to Athens and then to the ETO. Among the I-B officers questioned by the group was Brig. Gen. W. O. Reeder, recently-appointed head of the U.S. Foreign Liquidation Commission in India. Reeder explained in detail terms of the Dec. 24 agreement regarding the sale of surplus U.S. property in India to the Indian Government. The Senators were told that it was simply an agreement between the governments of the United States and India to meet for the purpose of arriving at final details whereby India will buy all surplus property of the U.S. now in the country. Representatives of the two governments will meet in Washington in the near future. Reeder told the committee that the United States suffered only negligible loss in the I-B from the unauthorized destruction of government property. He explained that deteriorated ammunition and chemicals have been authorized by the War Department to be destroyed and added that such materials were dangerous and had no monetary value. Knowland, who was appointed to the Senate in 1945 by Gov. Earl Warren of California following the death of the veteran Hiram Johnson, questioned officials as to the cost of maintaining troops in this Theater to protect surplus equipment. It was stated that although more troops had been available than was necessary, this was due to lack of troop-shipping during 1945. It was expected that shipping allotted for February would be adequate, for the first time, to move out all troops no longer needed. Testimony of local officials also brought out the fact that the Army hopes to have completed the evacuation of all U.S. troops from Burma by the end of this month. Following the formal sessions, Knowland held a brief press conference. He told reporters that the sub-committee would report directly to the Mead group in Washington before disclosing its findings to the general public. In reply to a question, Knowland, a former Major in the ETO, said that he believed the problem of demobilization was one of the most important now before Congress. He said that he has received a large amount of mail from soldiers and that "I believe their complaints are reasonable." "Speaking as an individual only," Knowland said, "I feel that the desire of American soldiers still overseas to be brought home at once is reasonable and understandable." He added that be believed his fellow Congressmen were aware of the situation, "especially if they have received as much mail as I have!" 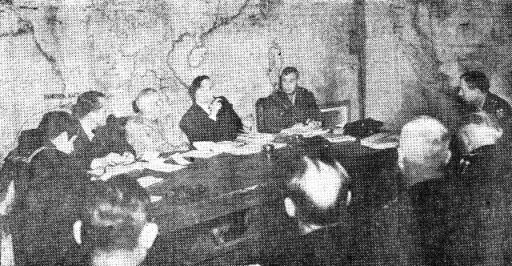 During an early stage in the morning session, darkness descended on the hearing due to a power failure which plunged the conference, held in the War Room at Theater Headquarters, into complete darkness. Field lanterns and flashlights were pressed into service until the lights came on again. Combining business with a bit of sight-seeing, the group halted briefly on Friday at Agra where they went through the Taj Mahal. Previous to their sessions in New Delhi, they conferred with Base Section officers at Calcutta. NEW YORK - There were 2,200 of us former I-B and China Theater troops aboard the Santa Paula when she passed the Statue of Liberty on the cold, grey dawn of Dec. 28 and caught the first few glimpses of metropolitan New York against the winter sky. The trip had been a pleasant one - for the most part. The officers and men aboard the former Grace liner had had sufficient elbow room on the whole trip. The food was "out of this world." Delicacies we hadn't expected to eat until we reached Stateside were on every menu. Officers partook of the meals off dishware, and EM used mess gear, but the food was nearly identical and the enlisted men got the lion's share of ice cream. Three times, including Christmas, there was turkey. We had cold storage eggs every morning, steak on occasion and fresh lettuce. The trip wasn't as rough as we expected although a few days in the Atlantic separated the men from the boys. Many of us were disappointed in the Suez Canal, which seemed nothing more than a ditch through the sand. The ship oiled at Port Said, but on the outskirts of the city and didn't weigh anchor, so personnel aboard saw practically nothing there. Choppy water buffeted the ship the first day in the Mediterranean, some of the passengers becoming afflicted with Mal de mer. After that it was smooth sailing until Gibraltar. This leg of the journey was relieved of monotony only by the close-in view of Pantelleria, island stepping stone for the Allied armies on their way to Sicily and Italy from North Africa. From the ship we could see little white houses in the folds of the bleak island's abrupt mountains. Remembering the indefensible position of the island's 10,000 Italian defenders, who were without naval or air protection, the term "like shooting a duck on a rock" came to mind. As we neared the Straits of Gibraltar a report that dirty weather was expected in the Atlantic spread like wildfire from the flying bridge to the holds - and rumor became fact as soon as we hit the larger ocean. For the next two days the Santa Paula plowed doggedly through mountainous seas, twisting, turning and bobbing like a cork, slowed down to only a few knots. Sea-sick pills, in many cases, seemed to have as little effect as gum drops. This writer is happy to report that he was a "good sailor," laughed at the angry sea and emerged without a "queese" in his tummy. Others actually had two meals - one down and the other - ! But those who followed the ship's advice to eat heartily and keep on one's feet reported it helped. IT WOWS ’EM Among the soldiers arriving in New York on the SS General Bliss which sailed from Calcutta, India, were Sgt. Frederick Bergen of the Bronx, who explains the insignia on the back of Sgt. Eliot Norat, Army photographer. Meanwhile, we learned of severe storms to our north, later substantiated by terrifying newspaper stories. Our skipper turned south, successfully skirting trouble but adding a couple of days to our journey. As we turned into New York harbor in the wee hours of December 28, everyone aboard had what our waiter, an old hand at sea, described as "channel fever." We were up at 3:30 a.m. but could only glimpse a light or two bobbing on the water or fixed to some indistinct point ashore. However, about 5:30 a saucy little cutter, aflutter with pennants and glistening with lights, drew alongside welcoming us home to Shangri-La. Two girls dressed in fur coats against the chill morning air, bobbed up from below decks and sang a song or two, ending with Sentimental Journey. Corny? Yes - but there wasn't a man aboard who didn't feel a slight tug in the vicinity of his heart. Minutes later, someone shouted he could see the "Old lady" in the harbor and there was a concerted dash to the port side, but through the dark and the mist only a faint outline of the statue could be seen. We docked at the foot of 44th Street, in the next section south of the battleship USS Washington which had battled her way through storm-tossed seas and arrived coated with ice from stem to stern. A band blared a welcome. On schedule we filed off the ship and were greeted by the ARC girls, dispensing toilet articles, milk, hot coffee and doughnuts. A short ferry trip and a train ride took us to Camp Shanks, N.Y., where a hot turkey dinner awaited officers and men in a common mess hall. All that now remained for most was transportation to our respective separation centers preparatory to receiving that slip of paper that would mean freedom. Available were convenient telephone and telegraph exchanges to which a mass wave of OD surged through snow-blanketed streets to tell wives, parents and sweethearts that 2,200 men from the I-B and China Theaters had completed a trip half-way across the world and that we'd be home soon. CHABUA - In North Burma, American pilots are back to "Combat Cargo" days. From mid-November till January, Assam Air Depot pilots were flying "by the seats of their pants" again, following the Ledo Road for direction, all navigation aids having been pulled out since November. Flying is permitted only under "CAVU" conditions - "ceiling and visibility unlimited." Since ATC resumed flying into Myitkyina again to air-lift caskets to Calcutta, the tower there has temporarily been put into operation again. At Rupsi and Korhat, where once planes had to wait an hour to get a traffic pattern for landing, now jeeps must shoot the cows off the runways when and if a C-47 comes in. At South Myitkyina where the transports used to land or take off every three minutes, making the strip busier than LaGuardia Field - it's quite an occasion now when one plane a day comes in. Five months after V-J Day, that's the picture of the U.S. Army Air Force in Assam and Burma - war-time, world-famous base for Hump operations. Of 22 fields formerly operating in the old NASAC area, only one at Chabua is left. The rest have all been returned to the British. Over 40,000 personnel have now been reduced to 800, principally concentrated at the Assam Air Depot, Chabua. The demobilization plan began to produce results during mid-October. The plan was to concentrate all Air Force property in Burma and Assam, first in the hands of the six Air Service Groups in the NASAC area. Then the inactivation of the Service Groups - the 301st, 329th, 52nd, 44th, 51st and 381st - was scheduled as fast as they could centralize their property at the Assam Air Depot in Chabua. When the Service Groups went out of existence they left detachments behind to guard the property to be sold in India, until the new owners could take possession. By mid-November it was possible to disband NASAC, leaving the Assam Air Depot to handle remaining supply functions. Now all the property has been moved to Chabua that had to be moved. The Service Groups are all gone. The job left to ship back the remaining 5 percent of excess property and ammunition to the port; and to guard and maintain the non-movable surplus property, like hangars, towers and steel matting, until the buyers take possession. To take care of the surplus property, detachments of two to eight men still remain at eleven airfields. These detachments maintain roving jeep patrols to cover property at outlaying strips in their vicinity. Things are pretty quiet for these last detachments. But solitude has some compensations. For instance - the Tezpur detachment lives in the plantation bungalow formerly occupied by the commanding officer of the Air Service Group - a full colonel. many other detachments too, are quartered on the private estates of tea planters. At the height of the property centralization program, it began to look as though personnel demobilization might outstrip the property removal. Assam Air Depot officials then organized an emergency airlift program to get the stuff into Chabua in a hurry. Every transport plane at the Depot's disposal saw service every day. Even at such a time, some strange items occasionally crept into the freight. Lts. Warren Bovee and Gail McDaniel flew a live, air-sick Himalayan bear to Calcutta, bound for the Toledo Zoo. "Mice-experimental-20 lbs." once appeared on the manifest for the Myitkyina-Ledo run. But coming up from Calcutta, the story is quite different than it was during the heyday of the Hump. Now there's room for such items as three plane loads of live chickens for enlisted men's mess halls in Burma, and fresh eggs and shrimp for the Chabua "brass." The wheel of history has come round nearly full turn. The cows and rice paddies have almost completely reclaimed their prewar domain in the valley of the Brahmaputra. The heavy equipment that once carved the Stilwell Road out of the jungle, comes to the end of the trail as junk to be sold as scrap at the Hazelbank Salvage Dump in Chabua. Cpl. Richard Moore of the 2258 QM Truck Co., who used to jockey trucks over the Road from Ledo to Shing, thoughtfully surveys the "dead dozers." One part of the job shipping excess property to the port finished, T/4 John A. O'Neill, 173rd Ord. 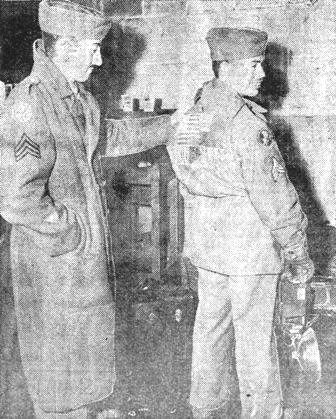 Depot Co. seals the boxcar door as T/4 William E. Kelly of the 3169th Ord. MM Co. waves a cheery farewell at Makum Ordnance Depot railhead. At Makum Ordnance Depot, excess property starts its long journey to the Calcutta port. Pfc. 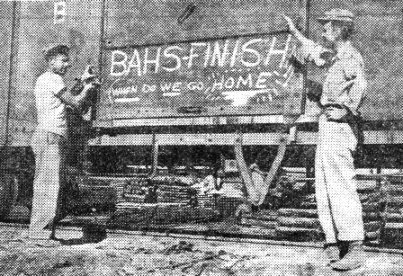 Will Howard of the 241st Ordnance Ammo Co. stands in the boxcar waiting to direct the load as Lt. Leo J. Sobizak, 173rd Ord. 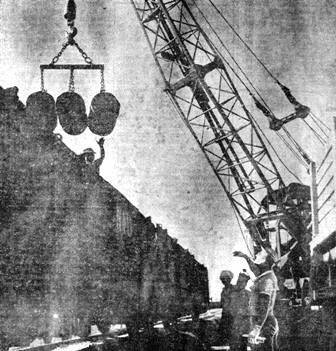 Depot Co. (on the ground) signals the crane operator. CHABUA - This is the story of how the "End of the Line" became the "Beginning of the Line." When the Japs were pushing deep into western China; when Allied troops in the Burma jungles were hungry to be supplied with bullets to push the enemy down toward Tangoon, Intermediate Section No. 2 in the upper Assam Valley became world-famous as the end-point of the longest supply line in the world. For it was here that supplies were collected for delivery over the Stilwell Road and over the Hump. Since V-J Day, the G.I. 's of upper Assam have worked with war-time gusto at the job of shipping back to the port about 90,000 long tons of excess property and old ammunition to be dumped at sea which had to be out before they could leave. Since November 1, the outfits of Assam have moved 85,000 long tons out of their area down to Calcutta in a two-month drive which Intermediate Section spokesmen say equals in sustained effort any period of similar duration during the war. As of the first week in January, only 5,023 tons remained which were scheduled to be moved out of Chabua and Ledo. The stuff was scattered over 915 warehouses in 25 major installations covering a 75-mile stretch along the Assam Trunk Highway, more accurately known to the boys of the QM Truck Companies as "The Bump." In all, 2,545,243 square feet of covered storage space had to be cleared of materiel and brought to central collecting points around Chabua. Material had to be cleared out of Burma and collected in Ledo. Then it had to be packed and crated according to elaborate War Department specifications for overseas shipment. Finally, it had to be loaded on the Bengal-Assam Railroad for the long haul to Calcutta. Barges on the Brahmaputra, which played a considerable role in the job of bringing the war goods up, were not of much value in this operation, because in the dry season, navigation is difficult. The speed of the evacuation depended largely on the facilities of the Bengal-Assam Railroad for trans-loading freight from meter-gauge cars to broad-gauge wagons (freight cars) at the Parbatipur bottleneck. This difficulty limited the number of cars which could be loaded in upper Assam to 128 per day. Rail transportation officers at Chabua were enthusiastic in their praise for the Indian railroad, though. They said that after the road had been returned by our Army to civilian control, Indian railroaders continued to operate the same schedules as had been previously maintained by the Army. Boxcars were still making the Sookerating-Calcutta run in five days. The biggest nightmare in the whole operation, according to Section spokesmen, was getting enough lumber and nails fast enough to keep the crating program on schedule. When the packing started, the need for lumber was estimated at 4,000,000 board feet. The only sources of supply were on G.I.-operated sawmill at Dum Duma and a few small civilian mills. Dum Duma could turn out only 25,000 board feet a day. Though old time lumber-men say that such a mill is washed up after it turns out 1,000,000 board feet, the creaking veterans at Dum Duma had delivered 3,000,000 feet before this program began. For a while it looked as though the target date for the evacuation of property might have to be pushed back. But finally, two more saw mills were obtained. The Air Force turned over its mill at Laika-Jan. And the Engineers built a brand new mill at Makum - had it operating just one and a half weeks from the time construction began. That took care of the lumber problem. But then came nails and banding clips. 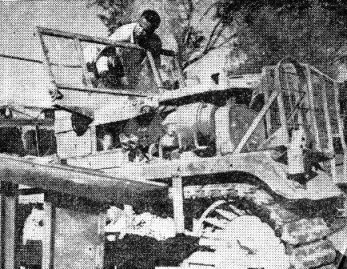 By mid-November every spare nail owned by the U.S. Army in Assam had been used up. British stocks were brought out. So three times a week for several weeks, every unused inch of space on the thrice-weekly plane from Calcutta was filled with nails. Even this was not enough, and three special planes loaded with nails were flown in. In some spots, banding clips became so scarce that regulation one and a half inch clips were cut in two for use. But boards out of a saw mill are not boxes. So the Ordnance men at Makum had to set up a complete box factory to prefabricate the crating. Even with the material boxed and banded, troubles weren't over. Only green lumber is available in Assam. So the usual seasoning process took place as the packaged goods lay out in the sun on the railroad sidings. Gaping holes, due to shrinkage in the wood, were daily occurrences. 4,900 civilian and Indian Pioneer laborers are still being employed daily. The program for shipping Army Exchange, Medical Department and Chemical Warfare Service property has been completely finished. The Signal Corps, Ordnance, QM and Engineer boys have just 5,023 tons to go, as of the first week in January. When that's finished, then the G.I. 's of Upper Assam should be near the end of the End of the Line. After completing a trans-Pacific flight in "Iron Lungs" aboard a specially-equipped C-54 hospital plane, two infantile paralysis victims from the India-Burma Theater are recuperating in Army general hospitals in the United States. Capt. George L. Baptie and Cpl. Walter H. Hargrave, both stricken by "polio" while on duty at Agra, India, left Calcutta in December for their 8,000-mile air trip to the States. Air Transport Command and medical authorities agreed on flying the patients over the Pacific instead of the regular route from Karachi west because of severe storms and temperature changes over the Atlantic and the inadvisability of crossing the Rocky Mountains with Capt. Baptie, who was headed for the west coast. Cpl. Hargrave was in better condition for his trip to Denver, Colo.
Respirators had been flown to the India-Burma Theater from Washington, D.C., but special adaptations had to be made for Capt. Baptie. A medical officer from the 142nd General Hospital at Calcutta went to Bangalore and supervised the virtual rebuilding of one "lung." During the peak of aerial evacuation of sick and wounded I-B troops from the Theater, the ATC carried more than 300 patients a month. Approximately 80 percent of the India-Burma patients evacuated before September, 1945, went "home" by air. Since the influx in shipping accommodations to the United States beginning four months ago, only about 20 percent of patients return to the States by air. They are patients requiring long periods of convalescence and whose conditions do not warrant a long trip - usually victims of fractures or burns. You think you have mail trouble? Sgt. Herman H. Katzenstein, now a "Delhi commando" after 14 months in the field with Chinese Army units, hasn't had a letter since Sept. 12. He has written at least one letter a day for the past four months. The sergeant's mail began to be redirected to sender way back in September when he was placed on orders "for movement to the Unites States." He was at Shanghai. He went to Kunming from there, then to Salua near Calcutta, where China troops were awaiting shipment home. In December, red-haired Katzenstein was yanked out of his Category IV unit and transferred to New Delhi for duty. The Katzenstein home is in a rural district near Asbury Park, N.J., and the Red Cross has just succeeded in contacting the family. Mrs. K. cabled Friday everything is fine at home and letters will be sent again pronto.